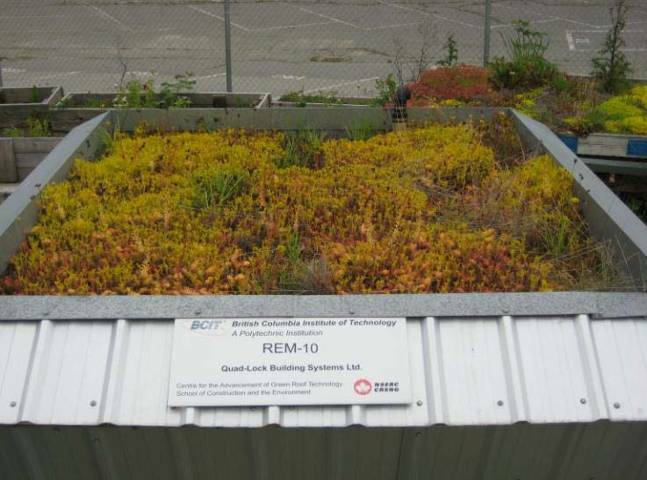 Surrey, BC: Quad-Lock Building Systems is pleased to announce the completion of a 2-year Green Roof research project in partnership with the British Columbia Institute of Technology (BCIT) Centre for Architectural Ecology. 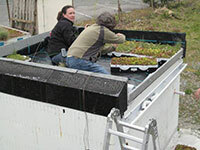 The BCIT facility has the mission of providing world-class independent research and education in the field of green roof and living wall technology. 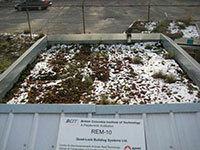 The goal of this study was to provide objective data on the performance of various green roof structures. 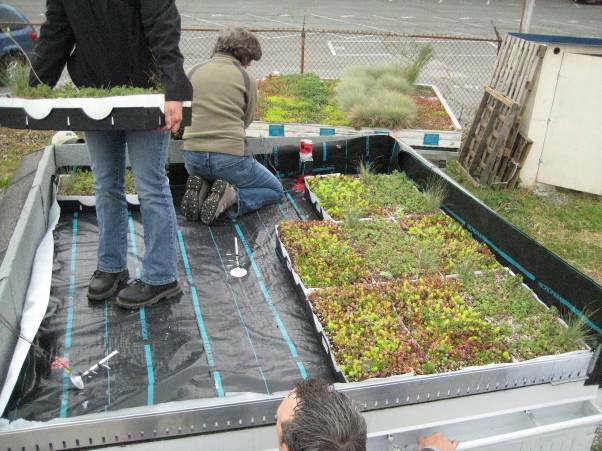 To our knowledge, this is North America's first green roof study to be completed on an Insulated Concrete Form (ICF) structure. 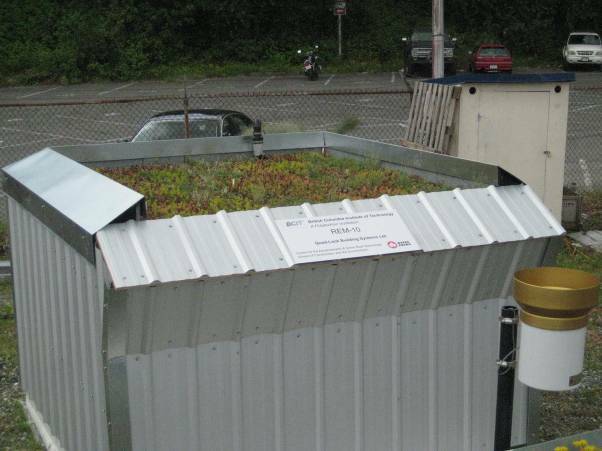 Quad-Lock's test structure (referred to as REM-10) incorporated an R-10 insulated slab foundation, Quad-Lock R-22 walls (6" concrete), and R-22 Quad-Deck (9" panels with 3" concrete slab) for the roof structure that's topped with a green roof layer (see below). This was compared side-by-side to a "control roof structure" featuring wood-framed walls and roof with an asphalt roofing layer (called Reference Roof). 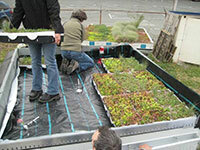 Heat Loss: Depending on the season, the Quad-Lock/Quad-Deck Green Roof REM-10 structure demonstrated a 50 to 75% reduction in heat loss, compared to the wood-framed control structure. 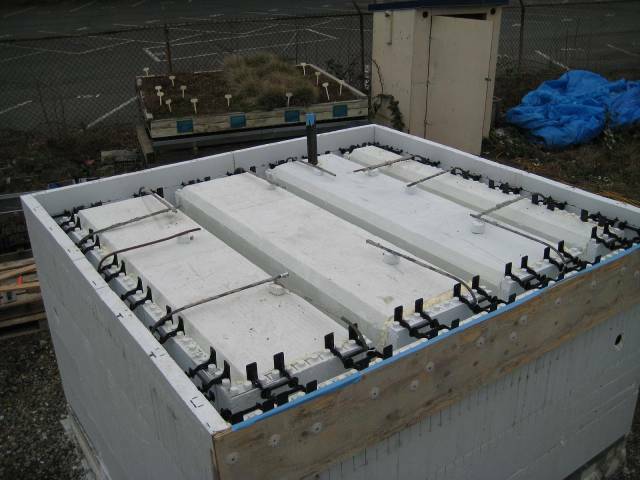 Heat Gain: Across all seasons, the REM-10 demonstrated an average 99% reduction in heat gain, compared to the wood-framed control roof structure. 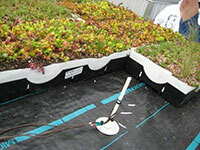 Stormwater Runoff: Compared to a conventional roof without green roof layer, the REM-10 retained a yearly average of 69% of the rain falling on the roof surface, with 31% potentially available for reuse or disposal in a municipal system. 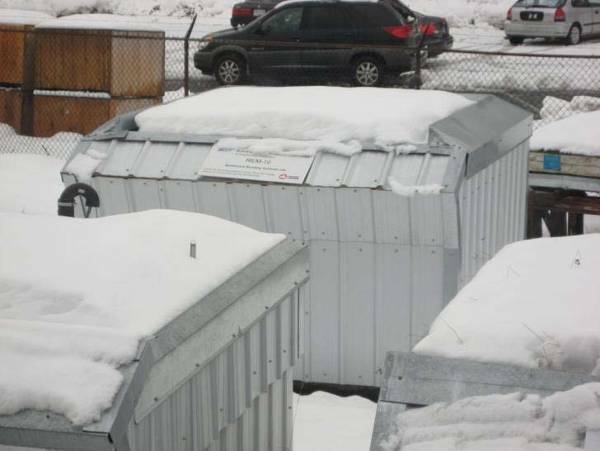 Comparing the heat flow performance of the two structures, it is noteworthy that there were near-constant temperatures measured on the interior of Quad-Lock's REM-10. These data provide direct validation of what we hear regularly from ICF building owners "the temperature just never seems to change in our house". 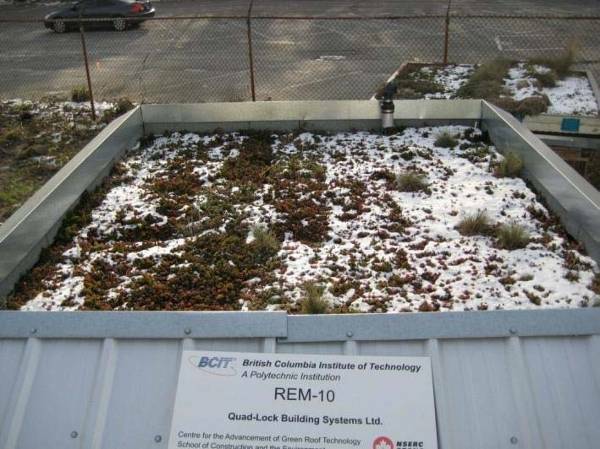 The clear benefits of ICF construction (and now green roofs) are increasingly supported by studies from respected institutions, like BCIT, CMHC, and its industry partners. 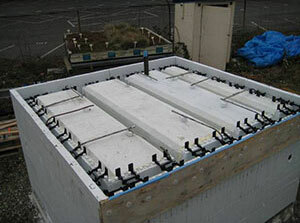 What the ICF industry has known for decades is now being proven in building science circles. In fact, BCIT Study Director, Maureen Connelly calls green roofs "...the greatest real estate opportunity of this century." 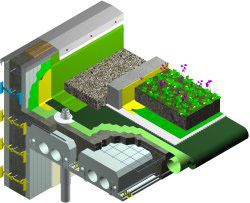 All modern buildings should have a clear Energy Management Strategy with Insulated Concrete Forms and Green Roofs being an integral part to meet or exceed sustainability objectives. The Quad-Deck Roof Forming system can be used to construct the ideal roof substrate for Green Roofs, combining better resistance to moisture, long span capacity, high load capacity, and lots of insulation. 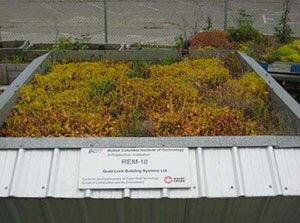 Read the report on BCIT's Performance Evaluation of Green Roof Systems. "After exhaustive comparisons of many different floor and roof systems, I found Quad-Deck to be the safest, highest performing, and most cost effective system available based on a life cycle cost analysis. This analytic method is the only measure of any building that is truly meant to last. 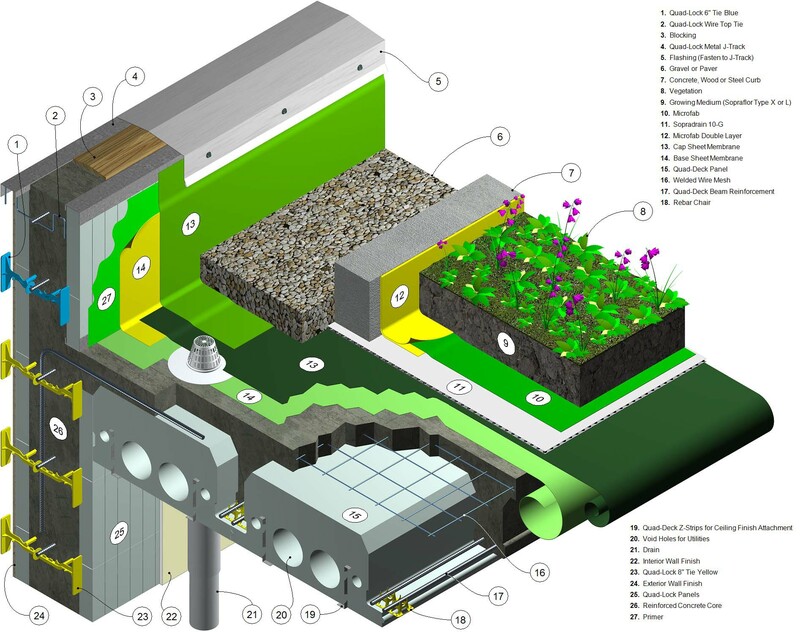 Quad-Deck's function as a thermal mass heat sink, its solid feel underfoot, flexibility of design vs. other RC systems, ability to span long distances, and function as a base for a green roof are just a few of the reasons why Quad-Deck is my horizontal structure of choice."